Separation from loved ones, reuniting with old friends, the reunion of families, happy couples, the sorrow of missed opportunities, anger over frustrated missteps in life… . These are all themes in Chinese culture reflected in such expressions as: 生死離別、悲歡離合、陰差陽錯、 两地相思、 两地分居、月圓之夜、月圓花好, and so on. The Seventh Day of the Seventh Month of the Chinese lunar calendar marks the fleeing moment when the star-crossed lovers — the Cowherd 牛郎 and the Weaving Maiden 織女, separated through the year by an angry fate, and the Milky Way — are able to meet for a night on a bridge of magpies. The Double Seventh Festival originated in beliefs and practices that predate the Western Christian era, and traces of it have even been found in the ancient Book of Songs. In recent times, as faux tradition has flourished under the aegis of state patronage and with the support of mass commercialisation, the festival has generated a measure of controversy. Although, as we will see below, it is also known as the Festival Beseeching Dexterity 乞巧節, marking as it does the handiwork of girls in sewing and weaving, it is now promoted as China’s indigenous answer to the Valentine’s Day of the West. Meanwhile, mawkish neo-traditionalists argue that the meeting of the long-separated Cowherd and Weaving Maiden has nothing to do with lover’s trysts. Rather it should be seen as a celebration of conjugal loyalty, not of connubial pleasure. The story of the White Snake 白蛇傳. For more on these folktales, and their recasting in modern times, see Wilt L. Idema, Old Tales for New Times: Some Comments on the Cultural Translation of China’s Four Great Folktales in the Twentieth Century, Taiwan Journal of East Asian Studies 9, 2012, no. 1 (Issue 17): 1-23. This is the latest in our series of New Sinology Jottings 後漢學劄記. Seventh Eve, in the hand of Liu Gongquan 柳公權 from a Tang-dynasty stele. Source: Stele of the Xuanmi Pagoda 玄秘塔碑 (the full name of which is: 唐故左街僧錄內供奉三教談論引駕大德安國寺上座賜紫大達法師玄秘塔碑銘並序), from the 28th of August 2017, Palace Museum Calendar 故宮日曆. On the seventh day of the seventh month girls of Peking each take a bowl of water which they expose to the sun, and put in it a small needle so that it will float on the surface of the water. They then long watch the needle’s shadow at the bottom of the water. Sometimes it is diffused as if in the shape of flowers, sometimes in movement like clouds, sometimes fine like a thread, or sometimes thick like a stick. [Thus a shadow thick like a stick would indicate that the girl is clumsy at needlework, whereas one fine like a thread would show the reverse.] By this means they can predict each girl’s dexterity of clumsiness. This is commonly called the laying down of needles. On the seventh day of the seventh month, if the moon is clear, the crows and magpies appear flying and calling a little later than usual, and it is commonly said that they have been away forming a bridge. Note: This has reference to an old legend, according to which the celestial Spinning Damsel (identified with the constellation Lyra) was banished from Heaven for a certain period and sent to earth. There she met the Oxherd (identified with the constellation Aquila), whom she married. They lived happily together until the time when her banishment came to an end, when she was forced to return to Heaven. The Oxherd tried to pursue her, only to be stopped in his progress by the Heavenly River (Milky Way), and since that time the lovers have been permitted to see each other only once a year, on the seventh day of the seventh month, when the magpies are supposed to form a bridge across the Milky Way over which the two may pass. But if on that day it rains, they are doomed to wait another year before meeting. A play representing this lovely legend is usually given on this day. According to the Rixia jiuwen kao, during the Jin (1115-1234) and Yuan (1280-1367) dynasties the courtiers of the Palace would wear (embroidered) insignia of a magpie bridge. 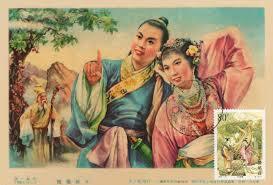 … But the present dynasty [the Qing], with its august frugality, has not revived such childish forms of amusement. Peip’ing: Henri Vetch, 1936, p.59. Romanised words have been converted to Hanyu pinyin. 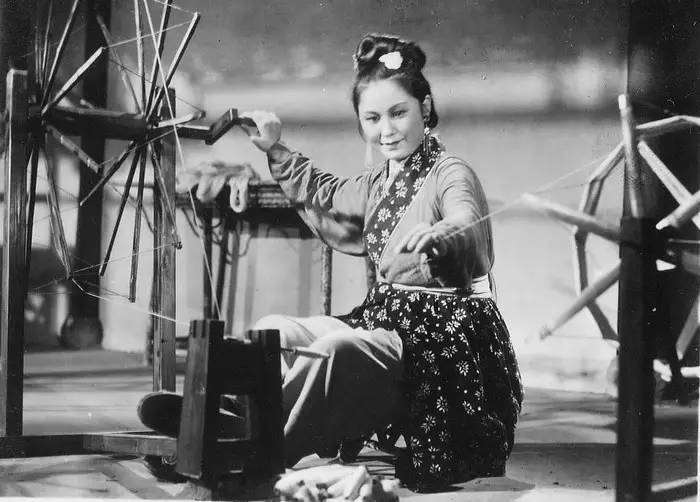 A Weaving Maiden, still from the 1953 film of the Huangmei opera, ‘A Heavenly Marriage’. Never they’ll meet for many a day. asking me what places I’ve been. pour the wine till we’ve drowned ten cups! The 2009 documentary film Last Train Home 歸途列車 by Fan Lixin 範立欣 depicts the annual ‘Spring Tide’ 春潮, or the mass movement of workers returning home for the Spring Festival Lunar New Year. It is a period that has taken on the celebration and sorrows of the Seventh Day of the Seventh Moon. In the Maoist era, the state had power over not only how people lived, but where they lived. The ructions of constant political movements and purges resulted in countless separations; couples and families were torn apart according to Party need, whim and as a punishment. A new language of estrangement and loneliness evolved, and the old metaphors and tropes of traditional exile and poetry re-emerged. The Milky Way an impassable torrent of tears. Yearlong the Cowherd and Weaving Maid ne’er can meet. Poster for Married to a Heavenly Immortal. Wilt L. Idema offers an extended discussion of this opera, the film adaptation and the rather convoluted relationship between the Twenty-Four Exemplars of Filial Piety 二十四孝 and the story of the Oxherd and the Weaving Maiden in ‘The Emergence of Regional Opera on the National Stage’, in David Der-wei Wang, ed., A New Literary History of Modern China, Cambridge, Ma. : Belknap Press / Harvard University Press, 2017, pp.585-590. Linda Jaivin and I were married in Beijing in 1986, and we celebrated our nuptials on the Seventh of July that year, close enough to The Seventh Eve, albeit we were all calculating things by China’s revolutionary Western calendar. Hsien-yi 楊憲益 and Gladys Yang held a party for our Chinese friends at their apartment in the Foreign Languages Press compound at Baiwan Zhuang. Over the years, these friends had acted as our Bridge of Magpies. 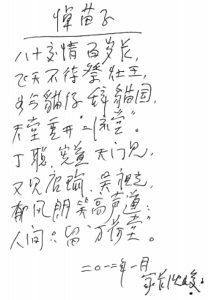 They included Wu Zuguang 吳祖光, Xin Fengxia 新鳳霞, Huang Miaozi 黄苗子, Yu Feng 郁風, Shen Jun 沈峻 (on behalf of herself and Ding Cong 丁聰), Yan Wenjing 嚴文井, Hua Junwu 華君武 and Yang Jiang 楊絳. Some of them had been members of The Layabouts Lodge 二流堂;* they had all suffered the capricious separations common in the first three decades of the People’s Republic. Much was made of the symbolism of the Double Seventh and hard-won reunions in the gifts, poems and the paintings they lavished upon us. Zuguang, who had the use of a stretch limousine for the weekend as a treat from a wealthy friend, urged us to avail ourselves of that grand palanquin. We were chauffeured around Beijing, and Tiananmen Square, in a state of delirious delight while toasting our union with flat, warm Chinese orange pop in cut crystal glasses. That was another time; all of those dear friends are now themselves part of our firmament. Linda and I are long since separated and apart from these feeble words, and tender memories, there is no bridge across which we might meet with them again. ‘Mourning Miaozi’, by Shen Jun. The Hall of Lotuses 萬荷堂 is the name of the artist Huang Yongyu’s 黃永玉 studio. Shen Jun passed away in December 2014.